And just like that summer is over, at least for the kids. Off to school they went yesterday. Summer seemed like a blur for all of us. I am ready for autumn to arrive. I am ready to say goodbye to the humidity and heat, which has been pretty bad this year. Bring on the crisp days! When I was food shopping with my daughter we found large portobello caps that looked like bowls. Which gave me a fun idea. Instead of bread bowls, why not mushroom bowls? To fill the bowls I made a quick chili. Normally you cook chili over a few hours but as this doesn’t have beans, this can be made in less than a half hour. In a skillet heat up a tablespoon or two of olive oil and begin to saute a half pound of ground beef. Chop about half a cup of red onion and a couple of cloves of garlic. Add that to the skillet. After the onion starts to soften add a can of diced tomatoes (14oz) and bring to a simmer. Begin to season with chili powder, cumin, and sea salt and pepper. The beauty of this dish is you decide how much seasoning to put in. Some like it hot and some don’t. I would say the ratio of the chili powder to the cumin should be about 4:1. As we like it hot I added a dollop of hot sauce that I made along with chopped bell pepper. Mix well and cook the peppers for a few minutes. Pre heat the oven to 400F/200C. 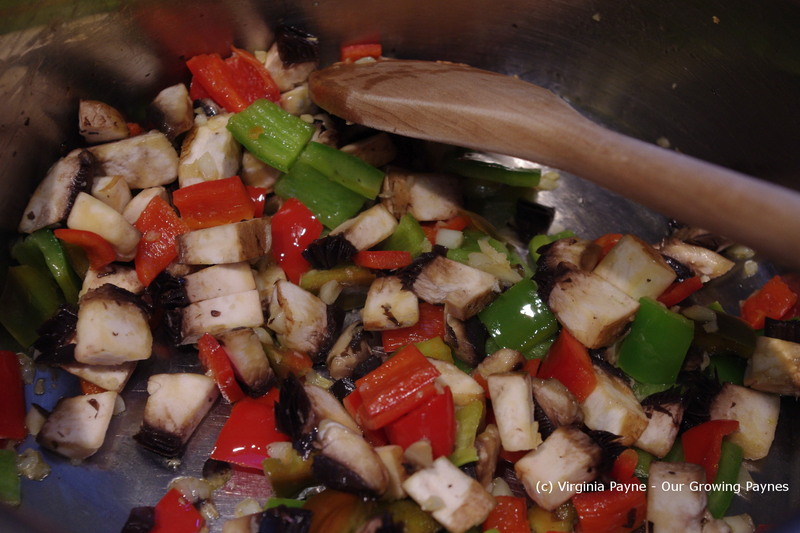 Fill the mushrooms with the chili mixture. Top with shredded cheese and bake until the mushrooms are cooked. You don’t want to cook the mushrooms so much that they collapse. Top with sour cream and enjoy! This is a very easy meal to through together on a weeknight. And it’s a fun twist on the whole food for a bowl thing. I love fall and spring. Warm enough not to have to wear a thousand layers but cool enough for comfort food. We had a hint of fall yesterday so I thought it was time for warm bowls of chili. I think this is my son’s favourite. I make ours vegetarian. I know it doesn’t look it from my previous posts but we do cook a lot of meals without meat. 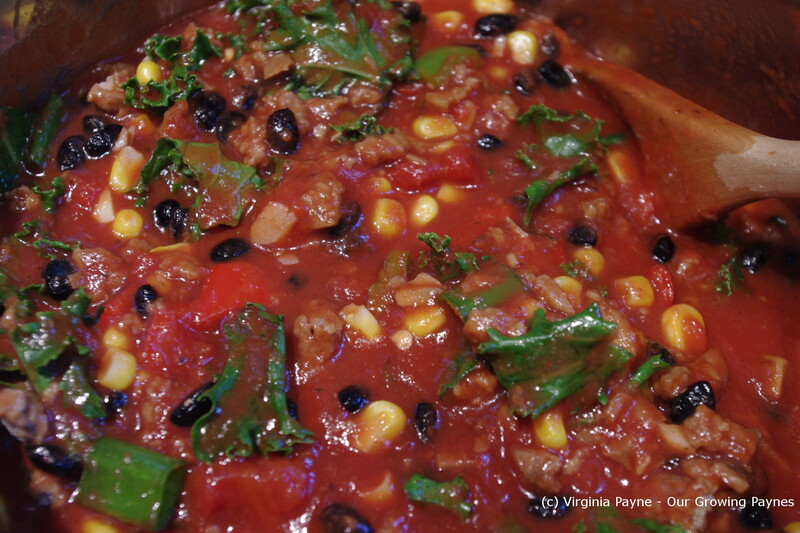 I do use in this recipe Morning Star “beef” as it adds protein along with the beans. But without all the fat or grease! First stop was out to the garden. 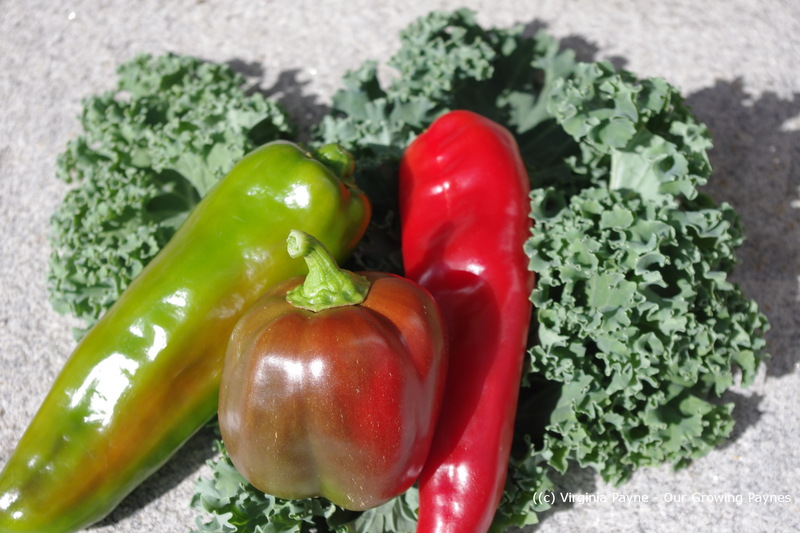 I picked some peppers and kale for the chili. We already had some scallions from the garden in the fridge that we needed to use up. 3/4 cup of black beans. If they are dried soak them in water for a bit, otherwise you have to simmer the chili for a few hours like I had to. Dice your veg to saute. 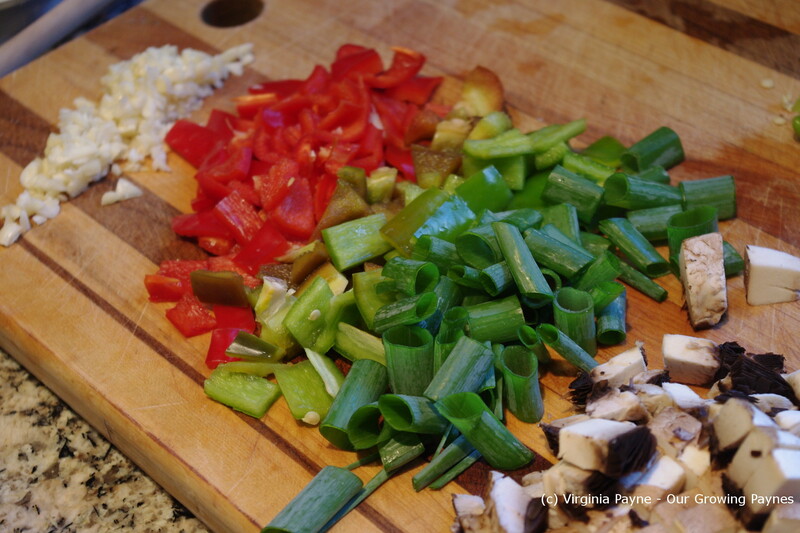 I usually saute the garlic and onions for a minute or so before the rest of the veg. If you are using scallions then add those as you are adding the sauce. Add a bit of lime juice to the sauteing veg. Then add the tomatoes and sauce, beans and corn. Bring to a simmer. Add the seasonings to the heat level you would like. Add the kale and the “beef”. Add a bit more lime juice and chopped fresh cilantro. Once the beans are cooked through it is ready to serve. I usually put hot sauce, sour cream and shredded cheese on the table. This is a super easy meal and prep time is under a half hour. The simmer time depends on the beans. And of course if you have it the next day the flavours are even better.